MAKE AND MATERIAL OF MORNING DRESSES. - This is the first time since Christmas that any change has been perceptible in the redingote; cloaks have almost disappeared; the lingering symptoms only of winter is a large shawl thrown over the morning dress, and on bleak days a muff. There is quite a new fancy for the front of the dress; a bias trimming, like a V reversed, finished at the corners with a blue bow of ribbon or an acorn. Walking dresses should be made of the simplest form: the materials now worn are in themselves sufficiently rich for demi-neglige: - there is a style of dress beyond expression elegant. - The corsage quite flat, and buttoned with gold buttons down the front; the skirt of a moderate width, (hail to that word!) the sleeves large and unadorned; the chief difference at the present moment between morning dresses and such as are worn at operas, or our theatres, consists in the shade of colour rather than the material or make. Redingotes of muslin, lined with colored sarsenet, are now frequently adopted as habits de reception; they are tied down the fronts with bows of the lace satin ribbon. PREVAILING COLORS FOR MAY. - Citron, jonquil, lilac, vert de Paradis, pale blue, and rose color. This is the first time since Christmas that any change has been perceptible in the redingote; cloaks have almost disappeared; the lingering symptoms only of winter is a large shawl thrown over the morning dress, and on bleak days a muff. I think what is meant by the first segment is that redingotes are finally getting lighter. 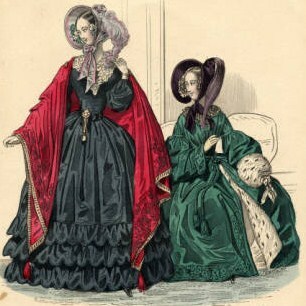 As in the eighteenth century, a redingote is a long-sleeved gown; it seems to count as "half-dress", used for walking and riding, but it can also be opera dress, which is very formal. The material seems to be more important than the form when it comes to the level of formality, muslin and lace for morning, satin for the opera. The references I can find generally mention that they are worn open in the skirt (and sometimes also bodice) over a petticoat or another gown. 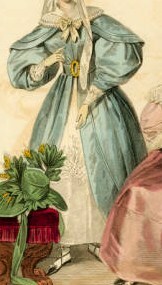 At the same time, "pelisse" was still in use, so there are probably some more criteria that separate the two garments: perhaps the pelisse was seen as a coat put on over a dress, while a redingote was worn over an underdress that was only meant to be worn under another gown, or just a petticoat. Redingote may also be used interchangeably with peignoir during this period. There is quite a new fancy for the front of the dress; a bias trimming, like a V reversed, finished at the corners with a blue bow of ribbon or an acorn. At the moment, I can't find anything to illustrate this. It's a strange trim pattern, as it would actually widen the waistline, which is probably why it doesn't turn up in the fashion plates or in paintings. Walking dresses should be made of the simplest form: the materials now worn are in themselves sufficiently rich for demi-neglige: - there is a style of dress beyond expression elegant. - The corsage quite flat, and buttoned with gold buttons down the front; the skirt of a moderate width, (hail to that word!) the sleeves large and unadorned; the chief difference at the present moment between morning dresses and such as are worn at operas, or our theatres, consists in the shade of colour rather than the material or make. I find that last bit very interesting, as there's a general line of thought that formality increases as the skin on view increases, and as the expense of the fabric increases. And while this is just one article contradicting that, the multiple citations I found for redingotes - satin redingotes for the opera, muslin redingotes for morning, silk redingotes for riding - does imply that the rule of expense and skin doesn't apply across the board. Definitely worth thinking about for this period. Redingotes of muslin, lined with colored sarsenet, are now frequently adopted as habits de reception; they are tied down the fronts with bows of the lace satin ribbon.